Lacey Bryant's paintings, like Lacey herself, have a massive presence within a small space. A keen observer of the patterns, connections and duality of all things, Bryant's new series of paintings continue to depict the poetic beauty in the odd and disconcerting. Her visual story telling can be described as a noir morality tale rather than a fairy tale. The ambiance is one of curiosity and trepidation…a foreboding dream in which the dreamer is lucid, consciously searching for the true meaning of their situation before they wake up. Her girls and boys are beautiful, not in the conventional tradition of perfect features, but rather because of their defiant gaze and confident stance that speaks of an age old wisdom in the soul, realizing too soon that childhood notions of a perfect world need to be set aside. Roots, veins, thread are the language Bryant often uses as metaphors for little connections that reach out and twine around things, getting tangled up or sometimes grasping where there is nothing to hold to. 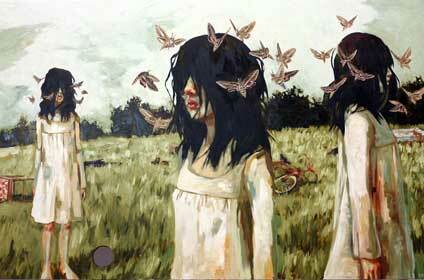 Birds and insects are also prevalent in her work. Her young subjects are the natural caretakers of these small species that are only slightly more fragile than the youngsters themselves. Creation and destruction, ego and soul, beauty and the unsightly all exist in natural harmony. The "other self', (occasionally more than just two) occupy the same space on her canvases with only slight acknowledgment for each other. Therein lies the human condition we each grapple with. Within Lacey's narrative, we see ourselves…our own duality of the beautiful and imperfect.